Arsenal were hit with some terrible news yesterday when Jack Wilshere was ruled out for the foreseeable future, and things didn’t get better this morning. Barcelona vice-president Josep Maria Bartomeu is boasting that Barcelona have acquired Cesc Fabregas on the cheap following his £29m move to Spain in August. Arsenal originally told Barcelona Fabregas would cost €60m earlier in the summer and Bartomeu believes that is the true valuation of the midfielder. The fact that Barcelona brought Fabregas for a figure almost half of that original estimation will not go down well with the Arsenal fans this morning. Cesc Fabregas has made a brilliant start to life in Spain scoring two goals in three appearances for Barcelona, and while Wilshere sits on the sidelines with an ankle injury, Fabregas is gaining rave reviews for his start in a Barcelona shirt. 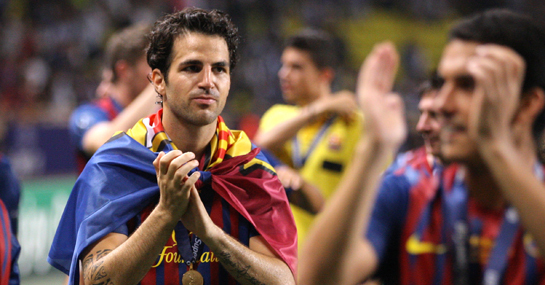 “The transfer of Cesc was a very good deal for us,” said Bartomelu. “His real price was what Arsenal initially asked – at least €60m. Fabregas may have started on the bench for Spain in Friday’s friendly with Chile but he proved the difference, coming on for Xavi in the 64th minute and scoring two goals to seal a 3-2 win for the World Champions. Mikel Arteta may have finally been handed his chance to shine at the top level, but while he is a solid acquisition for Arsenal, he is no Fabregas and with Wilshere on the sidelines until at least the end of October, Arsenal’s optimism following transfer deadline day is disappearing fast. The move to Spain seems to have handed Fabregas a new lease of life and Arsenal, known for their savvy transfer deals, will be rueing the day they gave in to Barcelona’s negotiations.